Hoop Love Whistler loves WAG! Beginner’s workshop with Nolita Ananda ~ Nolita will break down the basics to get you started in propelling yourself into full hoopla expertise!4pm to 4:30pmCircus hoop skills workshop with Toni Smith ~ Workshop designed for those who have a groove with their hoop already and are looking for some fun inspiration!4:30pm to 5:30pmCommunity Hoop Jam ~ hoopers of ALL levels can come along and use the space to play and practice. Groovy tunes to move to.5:30pm to 6pmPerformance Showcase with Toni Smith and Nolita Ananda. 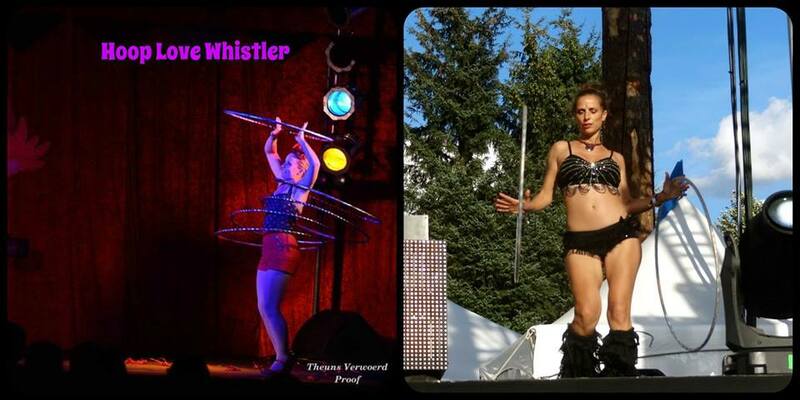 Even if hooping is not your thing, please come down for a hoopdance performance for the community to enjoy.This showcase is open to other Whistler hoop community performers to showcase their skills. Please PM to be added to the list.Nolita Ananda has been spreading the love of hoopdance internationally for the last eight years. Squamish Valley Music Festival and Spark Circus Thailand tour are on her list of highlight performances. Check out her website.Toni Smith is a comedian and professional street artist who has travelled the world with her show, performing in circuses and events since 1998. Originally from New Zealand, she now lives in Whistler. Her speciality is multiple hoop and circus tricks. Check out her website. Event will be followed by Birthday and Bon Voyage Bash for Nolita as she leaves for Thailand for the season the following day. Location to be announced.